That was a close shave!! So, youse all know how ah like tae shove stones alang wi' my nose. Ah enjoy it, it's good exercise, it keeps me occupied and it entertains wur customers. Nae harm in it or so ah thought. Admittedly, occasionally, ah swally a wee stone or two. Nae bother. Sometimes it's a wee bit sore and a feel a wee bit doon for a day or so. But it soon passes (literally!). Fur me it's worth the effort – a wee bit of discomfort for the pleasure of entertainin' folk and having a guid time. Well, last week that changed a bit. I don't really remember eating stones any more than usual but on the Wednesday ah didnae feel that good. Ah get a wee bit withdrawn an' like tae have a wee lie down in peace and quiet. Usually as ah say, it passes. Unfortunately, the next day dawned (as the next day will) but poor Mcleod still felt awfy ill. Him indoors, the big yin, took me up tae the Vet. They were awfy nice there. The Vet felt me gently all over an' said. "We'll need to cut him open". Aw, wait a minute. Wis ah hearin' right – cut me open? Tell me more. Ah like tae know the technical details before ah gie ma consent to any intrusive intervention but that sounded a bit. Apparently I had swallowed a stone that had got stuck in ma smaller intestine an' wisnae gaun anywhere. Oh dear, oh dear. Next thing ah'm lyin' oan ma back wi' a wire plugged intae me an' a wee bag drippin' some stuff intae ma boady. Ah looked doon an' ah was a' shaved doon below. There were ten stitches ah could see running right down to ma willy. An' ah could see ma willy too. Ah'd never seen it before. Ah mean ah knew it was doon there a'right but it was usually all covered over. Noo with ma stomach shaved, well, ah did feel a wee bit exposed. Ah wont dwell on the subject but suffice tae say the hale business wis a close shave. Ah'm fine noo. Ah wis a bit queasy for a day or two. The big yins been keeping me indoors and feeding me special meaty stuff and pills. He's a funny big fella. He wont throw me stones an' keeps muttering something about spending more "money on bloody dogs" than on hisself. Bloody cheek. Ah think they had tae have an operation to get his wallet open. His wee wifie is aff galavantin' again. This time it's Vancouver in Canada, sellin' wine, as if she's no' seen enough o' the inside of a plane this year. Ah'm fair lookin' forward tae havin' her home again. Maybe she'll throw me a wee stone or maybe a big stone (one a canny swally). Stands Scotland where she stood? Aye, weel it's been a busy month or two and noo we're well intae vintage – all hands tae the pumps (gettit?). First we had Macbeth, the Scottish play – right up ma street. My it wis a grand effort wi' witches, ghoulies, murder and death and stuff like that. It was gory and brutal and threatening an'all. Great, Ah am a terrir efter all. They even had some auld dudes riding their motorbikes tae lend tae the atmosphere. It was enuff tae raise the hairs on yer back. And they played on in wind and a wee bit o' rain. They were as brave and hardy as the characters they wis playin'. So, weel done the actors and weel done the audiences fur puttin' up with the Scottish weather (for the Scottish play). na tae wear so ye can see ah'm well in wi' the cast. Then, we had the Harvest Festival at the Cliffs on March 15 ("Beware the Ides of March" – ah know, ah canny help masel'). It wis a great day as usual tho' ah hud been worried sick that the weather was no gonna be any good. In the event it was ideal. Mind you, I was left behind (for no apparent reason) tae look after the customers at the cafe. The cafe is goin' like a fair an' that keeps me busy chasin' stones fur the customers. Some days when it's affy busy, ah'm knackered by the time everyone is gone – ah think some of the other staff are tae. In winter, we'll be more in the indoor restaurant which limits the distance people can throw stones fur me. Ah canny remember if the auld folks let me chase stones in the restaurant. Ah think they're no' too keen. Ah say let the customer decide. Ah'm game and as they canny throw stones too far indoors ah should be able to take it a wee bit easier – and hae a wee lie down in front of the cosy fire. An' noo it's vintage. Ah huv an important role at vintage tasting the grapes that fa' oot o' the de-stemmer/crusher or the press. It's a' part o' quality control. The auld man and me take the role of quality control very seriously though he tends tae drink out o' the bottle while I lap it up aff the concrete. Anyway, why no' come oot an' see me while the sun is still shinin' an' then ye can come back later in the winter for a cosy lunch indoors wi' yours truly as mine host. A' ra bes' a' ra time. Ah just wanted tae let ye know that we were a' sorry to hear o' our chef James (McMenamin)'s passing in the early hoors o' New Year's Day. We're a' gaun tae miss him. He wis a great chef and he an' me had some great wee chats about cookin' an' Scotland an' rocks an' that in our Glasgow patois. He even used some wurds ah didnae unnerstand tho' of course ah'm still quite young. He'd throw stones for me (some times at me) but he wis a great mate an' ah wis sorry tae see him fa' ill. Like everyone here at the vineyard café an' beyond we are going to miss him, his cooking, his patter an' his sense o' humour. Where did the last year went tae? New Year to ane and a'. Hope ye had a great time at Hogmanay and wurnae too sore on New Years day. Tradition was ye hud tae be 'first footed' (the first person to cross your threshold in the New Year) by a tall dark handsome man bearin' a lump of coal if ye were gaun tae hae a lucky year. 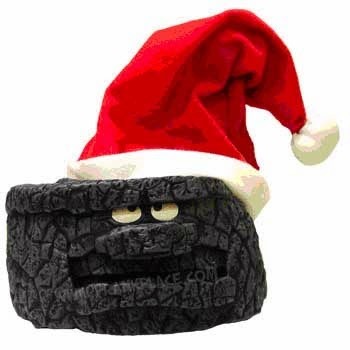 Well, am no tall but ah am dark and handsome and ah have been mistaken for a lump of coal. So, anywise, ah hope 2014 is kind tae ye all. Ah'm getting' worked aff ma feet these days. Ye should see the length of them. Ma bums almost scrapin' the grass. Ah could've said something a wee bit more coarse (and rhyming) but ah'm a highland gentleman. Anyway, it's been hard yards (feet) during the hoaliday season but ah've just had a rerr wee hoaliday wi' a' the family at Taupo â€" 6 adults and 6 weans. Mind you, sometimes it wis hard tae tell who were the adults and who the weans. The great thing aboot Taupo is the pumice staines. They're so light that ah can retrieve some pretty big yins without hurtin' ma nose too much. Trouble is ah can also chew them and the wee bits get stuck in ma stomach. So, ah hud a coupla days there when ma stomach was givin' me gyp. Still, what goes in comes out â€" eventually. An' all's well that ends well. And ma ends well noo! Talkin' of Shakespeare (which we weren't). We've got the Scottish play (Macbeth shhhh!) being performed by they students from Victoria University on 6, 7 and 8 February (kick off 6.00pm). It's gonnae be great. Ah'm hopin for a small part (get it?). Ye can get yer tickets frae the vineyard, Hedley's Books in Masterton, Almos Books in Carterton or the Wine Centre in Martinborough or on-line fromwww.gladstonevineyard.co.nz. "Stands Scotland where she stood?" That's a quote frae Macbeth y'know. Reminds me o' Chic Murray, a Scottish comedian from long ago (pre - Billy Connolly) who when asked if he had ever seen Dumbarton Rock said he'd looked at it many a time but never seen it move once. Ha ha! Talkin' of well done (though we shouldnae) Bella's been joined (for a wee while, shoosh) by two wee porkers by the names o' 'Sausage' an''Sizzle'. Nice names right enough but Ah don't know why the oulds aye snigger when they tell folks. Anywise ah get along wi' them fine an' Bella pits up wi' them as long as they stay away frae her food. Ye can come an' visit them if ye like. We had a great wee weekend around Bastille Day (quatorze juillet). Of course, ye know we (wee) Scots are great mates o' the French. Those of you who have drunk our 'Auld Alliance' (our Bordeaux blend) will know the first auld alliance dates back to the thirteenth century. While it was a military alliance, the great thing then was that the best French wines came to Leith (Embra) before they went onto Tilbury (Lundin). This is why the first ever breath test was to be able to say "The Leith Police dismisseth us" without slurring yer wurds. Ah slur ma wurds anyway, so ye can never tell wi' me. The Scots luv fur Claret came frae thae days. Tha's whit Rabbie Burns drank – explains a lot. In those days they drank it by the pint. At that time claret hud about 9% alcohol no like today's 12 or 13 – but a pint?! Nae wonder Tam o' Shanter could see witches and ghoulies as he rode o'er the Brig o' Doon. Anyhow we had a wee decorous glass of our Auld Alliance as part of our special Bastille Day lunches. No me mind. I wus oan duty. Apparently, les escargots were tres magnifique – they musta been because there were none left over efter 'cos ah hud a good look. 'Paris breasts' were the most popular desert. Ah don't know what James our chef was thinkin'. Ah'll no' try to describe the dish but it was two mounds of brulee with strategically placed cherries on top. Tres jolie, righ' enough We had French music too and the tricolour was well in evidence. An' ah had a great audience for ma rock retrieval exhibition. During the school hoalidays we had a' the weans here fur whit seemed like weeks but was only a few days. Actchully, it was rerr. They played on their bikes an' ah tried tae keep up – see ma wee legs gaun like the clappers. An' they threw stones for me which was great. An' they let me play in the dress ups wi' them ho' nane o' the cloathes quite fitted. An' now we've got Spring (printemps) tae look forward to. Soon enough it'll be Daffodil Day an' ah'll have tae update ma stone pushin' routine. They say ye've got tae have a good nose to work at a winery – well ah've certainly got that.